Simply stated, a "commons" is something owned by everyone and so by no one. Moreover, a commons is the "birthright" of every living thing—not just humans. From a global, human perspective, however, it is the vast realm of our shared heritage, which we typically enjoy and use free of toll or price. Air, water, and soil; sunlight and warmth; wind and stars; mountains and oceans; languages and cultures; knowledge and wisdom; peace and quiet; sharing and community; and the genetic building blocks of life—these are all aspects of the commons. The commons has an intrinsic quality of just being there, without formal rules of conduct. People are free to breathe the air, drink the water, and share life's experiences without a contract, without paying a royalty, without needing to ask permission. The commons is simply waiting to be discovered and used. 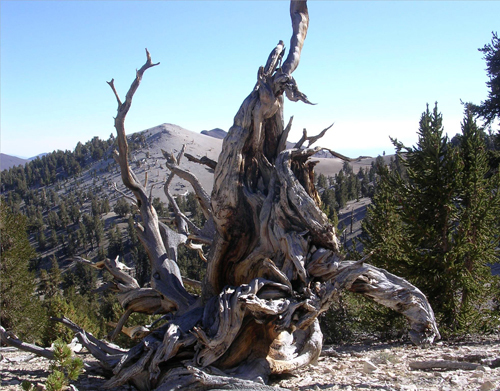 Bristlecone pine in the Sierra Mountains of California. For example, as a youth in the 1950s, and even as a young man in the earliest years of the 1960s, I could stand on the shoulder of a mountain in the High Cascades of Oregon or Washington and gaze upon a land clothed in ancient forest as far as I could see into the blue haze of the distance in any direction. My sojourns along the trails of deer and elk were accompanied by the wind as it sang in the trees and by the joy-filled sound of water bouncing along rocky channels. At others times, the water gave voice to its deafening roar as it suddenly poured itself into space from dizzying heights, only to once again gather itself at the bottom of the precipice and continue its appointed journey to the mother of all waters, the ocean. Throughout those many springs and summers, the songs of wind and water were punctuated with the melodies of forest birds. Wilson's warblers sang in the tops of ancient firs, while the plaintive trill of the varied thrush drifted down the mountainside, and the liquid notes of winter wrens came ever-so-gently from among the fallen monarchs as they lay decomposing through the centuries on the forest floor. From somewhere high above the canopy of trees came the scream of a golden eagle, and from deep within the forest emanated the rapid, staccato drumming of a pileated woodpecker. These were the sounds of my youth. This was the music that complemented the forest's abiding silence—a silence that archived the history of centuries and millennia as the forest grew and changed, like an unfinished mural painted with the infinite novelty of perpetual creation. And so it is that every aspect of the commons engages people in the wholeness of themselves. It fosters the most genuine of human emotions and stimulates interpersonal relationships in order to share the experience, which enhances its enjoyment and archives its memory. Herein lies an paradox, while we are compelled to share our life's experiences with one another to know we exist and have value, we are forever well and truly alone with each and every thought, each and every experience and the emotion it evokes in our personal journey from birth through death. A baby comes into the world outside of its mother's womb with its own experience of life within the womb and the birth process, something the baby can never share, even with its mother. In turn, the mother has her own experience of nurturing her child before birth, as well as the process of giving birth, which she can never share—not even with her child, albeit they coexisted for nine months of their respective lives in the most intimate connection two human beings can have. When we die, we pass out of life as we know it, but without being able to share the experience, even when surrounded by family and friends. Therefore, we are born and we die alone—the only person in the world who will ever truly experience the essence of who we are in our life. Even if we could verbally share an experience with someone who had been through a similar situation, we would still be alone with our own rendition of it because all we can share are metaphors of our feelings and emotions through a chosen combination of words available in the language we are speaking. In this sense, words can be likened to incandescent light bulbs because each bulb can have a different shape, clarity, color, hue, brightness of color, intensity of the light based on wattage, and can be energized by a 110- or 220-volt current, depending on the nation one is in (different shades of meaning based on the way individuals interpret such things as color and hue); yet all these various light bulbs share the commonality of electrical impulse—the energy (feelings and emotions) that fuel them. Besides, our ability to share the exact meaning of the metaphors we choose depends on how conversant the person with whom we are visiting is with the language and the degree to which our experiential similarities coincide. We cannot, however, share the feelings, emotions, or thoughts themselves because they cannot be expressed directly through language, only through the metaphorical shadows they cast. Even two people in the midst of a deeply intimate, sexual union have vastly different, private experiences, which neither can accurately portray to the other. If the notion of being alone is expanded into the arena of life, it soon becomes apparent that we are alone with each thought we have, each question we ask, each decision we make, each rainbow or flower we observe, each bird's song we hear or symphony we listen to, and each emotion we feel. We are alone—totally alone—within a psychological world of our own making, regardless of how extroverted or introverted we are. Be it a world of exceeding beauty or terrific horror, we are the sole creator of the life we experience, and we live it alone—both as creator of our thoughts and as prisoner of our thinking. Our aloneness, in all its forms, is the essence of spiritual union with the Eternal Mystery, which transcends all words and their contrived meaning, because our solitude pares life down to only what is self-created and nothing more. Thus, solitude itself transcends all material understanding and in so doing is touched by the unifying paradox of the cosmos: namely, all things are interrelated and alone—alone and interrelated. 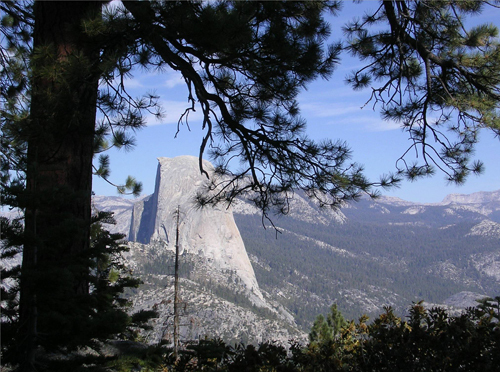 Half Dome in Yosemite National Park, California. Although I delineate the global commons into three entities for discussion's sake, astronomer and author Carl Sagan points correctly to their indivisible unity when he says, "In order to make an apple pie from scratch, you must first create the universe. "2 The initial delineation encompasses the gifts of Nature, such as clean air, pure water, fertile soil, a rainbow, northern lights, a beautiful sunset, or a 5,000-year-old bristlecone pine growing in a national park. Nature's commons, says author Jonathan Rowe, is the "hidden economy, everywhere present but rarely noticed. "3 It provides the basic ecological and social support systems of life and well-being. The second category of commons is represented by cultural creations that include such historic architecture as Notre Dame Cathedral, paintings by Vincent Van Gough and other great artists, music by such composers as Ludwig van Beethoven and Franz Schubert, literature by Leo Tolstoy, and children's stories by Beatrix Potter. And the third type of commons, now in its infancy, is purposefully created social-environmental sustainability consciously designed to benefit all generations. Carl Sagan. First Science.com. http://www.firstscience.com/home/poems-and-quotes/quotes/carl-sagan-quote_2284.html (Accessed January 2, 2009). Jonathan Rowe. The hidden commons. Yes! A Journal of Positive Futures. Summer (2001):12-17. Photographs by and courtesy of Sue Johnston. All rights reserved. © Chris Maser 2009. All rights reserved.